← Best Romantic Read Award – whoopeeeee! 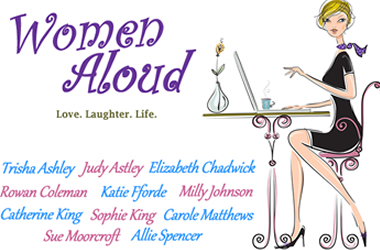 Women Aloud and free podcasts – yup, free! I was proud to be asked to take part in an innovative project – an charity anothology of short stories in audio form in support of the Helena Kennedy Foundation: Women Aloud. We had a great launch in London at the Women’s Library, with a stirring speech from a young woman who had been helped through university by the Helena Kennedy Foundation. Her education had been interrupted through her family circumstances, and HKF gave her the extra support she needed to succeed. As you can see, there are loads of great authors on this CD, and it makes a great Christmas present. Buy it here. In support of National Short Story Week I took part in a podcast hosted by broadcaster Sue Cook, and with writers Rowan Coleman and Sophie King. Sue Cook usually puts her excellent writing programme, The Write Lines, out on BBC Radio Oxford, but she agreed to create a special podcast for National Short Story Week, and you can listen for free, here. I took part in the ‘Women’s Fiction’ podcast but, as you’ll see, there are great podcasts about the British Short Story and Children’s Fiction, too. The National Short Story Week website is really worth looking at, by the way – an amazing free resource.